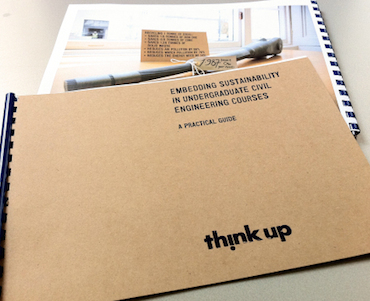 This popular Think Up report provides lectures with practical suggestions for ways to enhance the way sustainability is taught to undergraduate civil engineers. It was produced with support from the Royal Academy of Engineering and the Joint Board of Moderators, the body responsible for accrediting civil engineering courses in the UK, and is available by clicking on ‘downloads’ just over to the right. Universities in the UK are obliged to embed sustainability as a key theme in undergraduate civil engineering teaching, but sustainability is an area of undergraduate teaching that many departments find difficult to define, deliver or assess. In this report we identify three challenges that engineers must overcome in order make progress in the field of sustainable design: complexity, values-based decision making; and interdisciplinary working. We have made the overcoming of these challenges the basis of nine principles for how sustainability can be enhanced in the undergraduate curriculum, providing tools, free online resources and suggestions for classroom implementation. The findings of the report are based desk research, interviews with teaching staff from the Universities of Bath, Brunel and Edinburgh and on the outcomes of a half-day JBM conference on teaching sustainability that Think Up designed and facilitated at the Institution of Structural Engineers.